In Sen no Rikyu's times it was normal for political people to share a cup of tea in a tea hut. In Japan this tradition still exists, in a form proper for this century. Yesterday in Romania the prim minister of Japan was in Romania, and his wife, Mrs. Akie Abe visited such a tea hut / Chashitsu together with our minister of Culture and other personalities, and could drink a cup of tea on tatami. The Japanese Embassy organized this great event, inviting Mrs Abe at the National Museum of Arts in Bucharest, where a Chashitsu was built. The National Museum of Art in Romania / MNAR, which is situated in the old Royal Palace, together with the Japanese Embassy, with the architects, with Takenaka, the company that built the Chashitsu, with the help of Chado Urasenke from Kyoto and of the JTI Romania finished the building of the Chashitsu, inside the museum's section dedicated to the Japanese and Oriental arts. The school of tea ceremony, Chado Urasenke from Kyoto gave the name of the Chashitsu, RYŌKOAN, writen on a hangaku. The event included the ceremony of opening this Chashitsu and of it's hangaku. Mrs Akie Abe, Mrs. Ambasador Ishii, the minister of Culture, the director of MNAR and the director of JTI performed this ceremony. 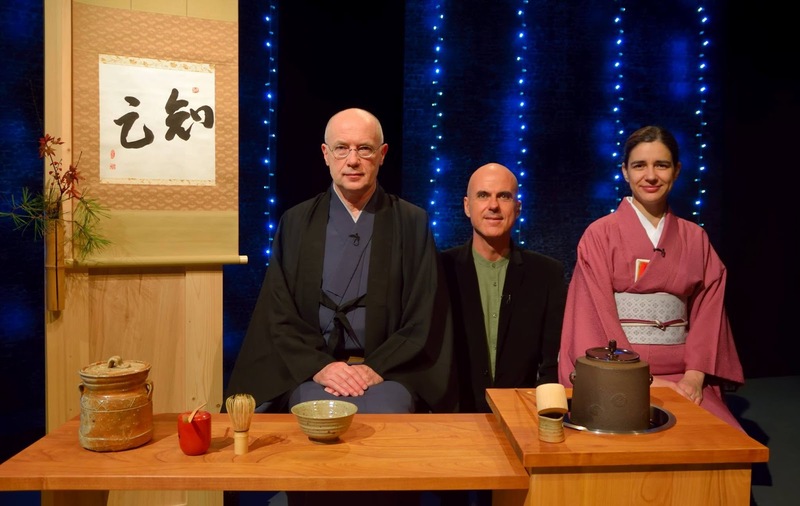 The tea ceremony was performed by Tsutsumi sensei, representative of Chado Urasenke and her student, Mr. Kani, from Paris, with the help of both Chado Urasenke Tankokai Romania Luminis and Chado Urasenke Tankokai Romania. On a rather rainy December day we have been invited by Mr. Matei Georgescu at his Television Show, called "Interviurile lui Matei Georgescu", at TVH. The television was situated right inside the building of an University in Bucharest, and it is actually that University's television. We have found out that Mr. Georgescu is a professor there, and also a psychoanalyst. Every week he has an interview, and discussions are always on some interesting cultural aspects. That particular day he was interested in Chado and Chanoyu. Our meeting with him was quick and as smooth as possible. Just one phone call from him and there we were, making and drinking tea together. First of all I have to say I am happy to realize that Chanoyu has gained enough visibility in Romania for people to become curious about it and to have TV shows about it. It is an endless subject for discussion, for Chado/ Chanoyu are the essence of the Japanese Culture. We have presented Chanoyu and Chado in so many places and in so many different ways, that I hope the Romanian public can see this philosophy and practice in a larger perspective now. Here is the link to this TV show, were Gabriel Caciula Soga sensei speacks about Tea Ceremony with Mr Matei Georgescu and prepares a cup of tea for both our host and myself.